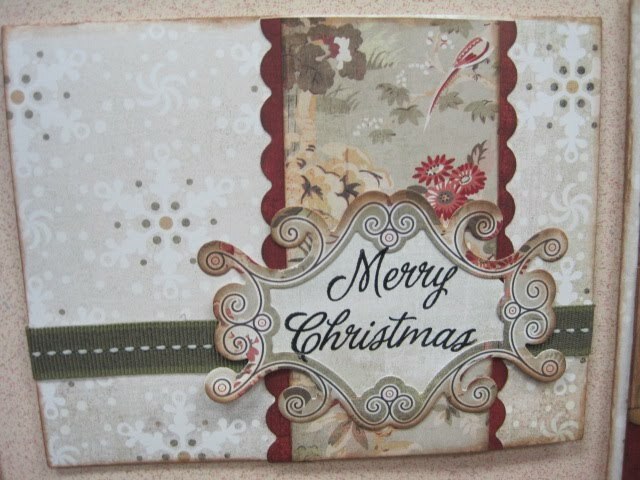 Have you started your Christmas cards yet? If you are like me, nope! I know quite a few of our customers are early birds and have been working on them since October or are already done. I envy that kind of ambition! Over the next few weeks, we will be posting pictures of different Christmas cards to help those of you out that haven't gotten the ball rolling yet. Hopefully, this will inspire you all to get in here and get some cards out before Decmeber 24th! We will also be posting different gift ideas, layouts and mini albums so there will be no excuse to not be putting your crafting abilities to use this holiday season. 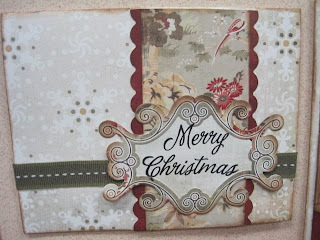 This first card is from our Basic Grey Christmas Cards & Tags class on Sunday November 22nd. If you haven't signed up, there a few spots still available. Hope this gives you the motivation to get those cards done! !